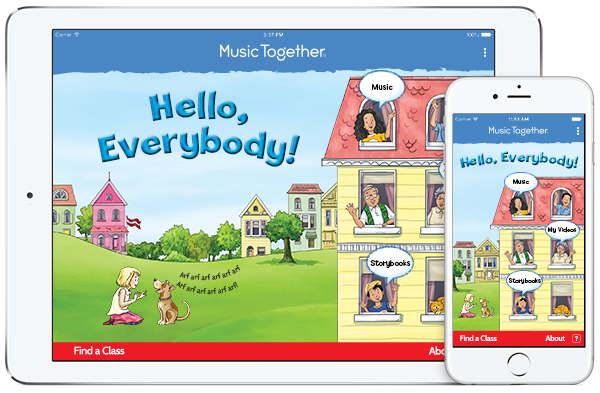 To make it as easy as possible for your family to play along with Music Together® at home, families may take your Music Together songs anywhere with the Hello Everybody app and get more activity ideas on the Family Music Zone. Check out the free Hello Everybody app for iPhone/iPad or Android. It's an easy way for you to access your Music Together songs, whether you are at home or on the go! Log in with your Family Music Zone® account (or create a new one on the app) to get your songs into the app. Then, have fun singing and dancing along from wherever you are. Flip through the award-winning Singalong Storybook, Hello, Everybody! To create an account or add a new collection of songs to the app, you will need the 15-digit access code. Starting the fall 2018 with the Fiddle collection, access codes are inside the front cover of your songbook. Previously, access codes were on the inside front cover of your CD booklet. To create an account, select "Log in" from the app menu and follow the on-screen instructions. Create an account with your e-mail address and a password. Or, if you already have an account on the Family Music Zone (the FMZ is a digital page for families; different from the app), then use the same login information as you have for the FMZ account. Once finished, you can immediately use your account. To add a new collection to your account, login using your registered email address and password, select "Access Code" from the app menu, enter your code and tap "Submit." Your new music will immediately appear in the app as long as you are logged in. The names of all the collections you've entered will appear along the bottom. Scroll sideways, on the red bar at bottom, to access your collections! As a member of the global Music Together family, you also have access to the Family Music Zone® on the Music Together Worldwide website. There, you'll be able to download your music, view a digital copy of your songbook, get new activities to try at home, and learn more about your child's music development. To create an account or add a new collection of music, you will need the 15-digit access code from the inside front cover of your songbook (fall 2018 and laterr) or song collection CD booklet (before fall 2018). Then go to the Family Music Zone. To create an account, click the "Create Your Account" button, enter your code, enter your email address, and create a password. Accept the terms of service and click the "Register" button. To add a new song collection, click the "Login to Your Account" button and enter your registered email address and password. Once you are logged in, select "Access Code" from the upper right hand navigation bar, enter your code, and click "submit". If you have any trouble, please contact Music Together support at support@musictogether.com for assistance.